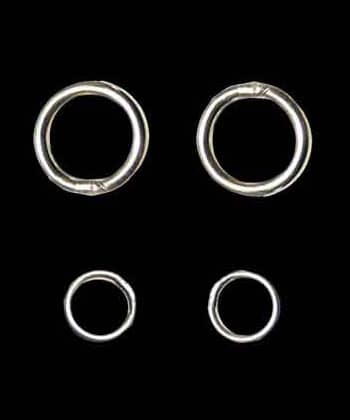 Welded metal o-rings for installing flowcord onto your poi heads and handles. Comes in pairs - you will need 2 pairs of o-rings per pair of poi (4 rings) - one ring for each end of your cord. We offer the rings in pairs - not in sets of 4 - because some people want 2 of each size. - internal diameter x thickness= 8mm/0.32" x 2mm/0.08"
- internal diameter x thickness= 5.5mm/0.21" x 1.2mm/0.05"